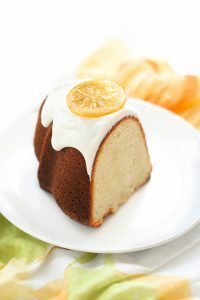 Lemon Bundt Cake – easy lemon pound cake recipe that packs a powerful lemon punch, topped with a relaxed cream cheese glaze and candied lemon slices. Another holiday is almost upon us and I don’t know about you, but it feels like Christmas was just yesterday. I love going all out for holidays, but sometimes reality sets in and you have to timebox your projects a tad. You know, so you can actually spend time with your family celebrating the holiday! 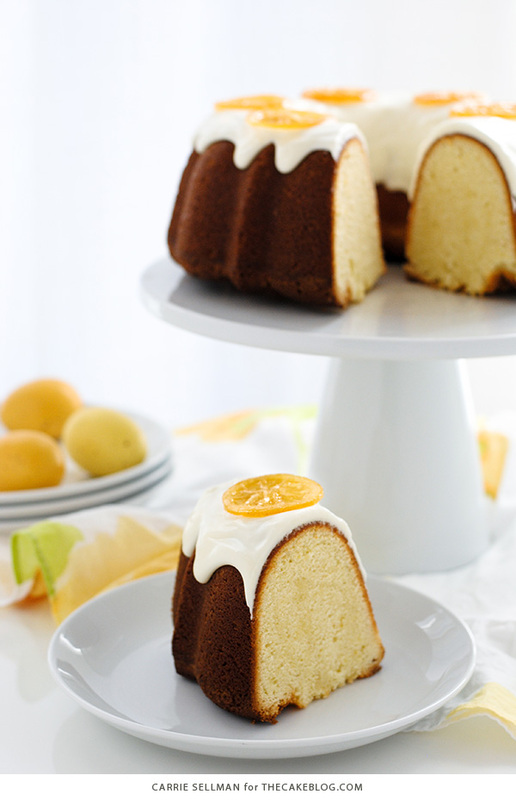 If you can relate to life being on warp speed, today’s Lemon Bundt Cake recipe is definitely for you. 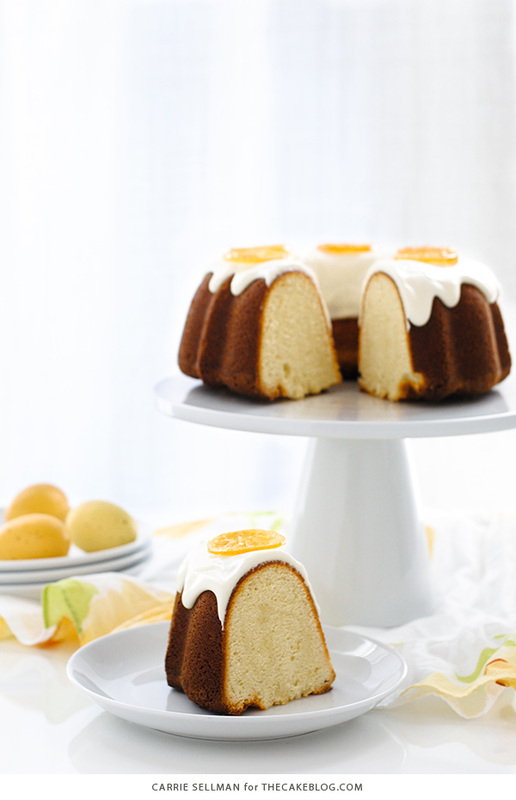 It’s elegant enough for Easter entertaining yet won’t have you in the kitchen all day. There are no layers to tort or fillings to make, and the frosting is relaxed yet totally delicious. Plus, we’re being strategic with the prep work and making the most impressive part in advance, leaving us plenty of time to hunt for Easter eggs with the kids! It all starts with a rich cream cheese pound cake that bakes up crispy sweet on the outside yet soft and buttery on the inside. Lemon zest add a mild tang that’s deepened with the help of some lemon extract. Then comes the super simple icing that is somewhere between a glaze and a cream cheese frosting. Packed with a powerful punch of lemon, it drips ever so slightly and sets up once refrigerated. So you don’t have to fuss with making it perfect. Top with your made-in-advance candied lemon slices and you’ve got Easter dessert in the bag. 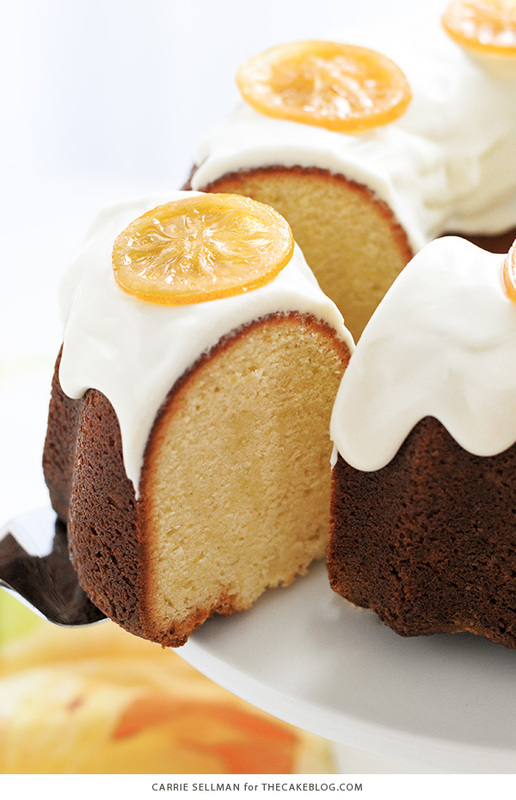 These candied lemon slices are what elevates this cake to special-event-worthy. They’re deliciously sweet and tangy with a chewy candy texture that comes from simmering water and sugar. Although they take some babying while making, they keep super well and will hang out in the fridge for a week without losing any of their amazingness. That means you can knock these out way in advance, saving you time later on. The best part about this cake is that it works for a number of events. It can easily be the centerpiece of a bridal shower or a Mother’s Day brunch, even a spring birthday or relaxed summer BBQ. And of course it works for Easter! Just dress it up or down with different cake pedestals and linens to fit the occasion. 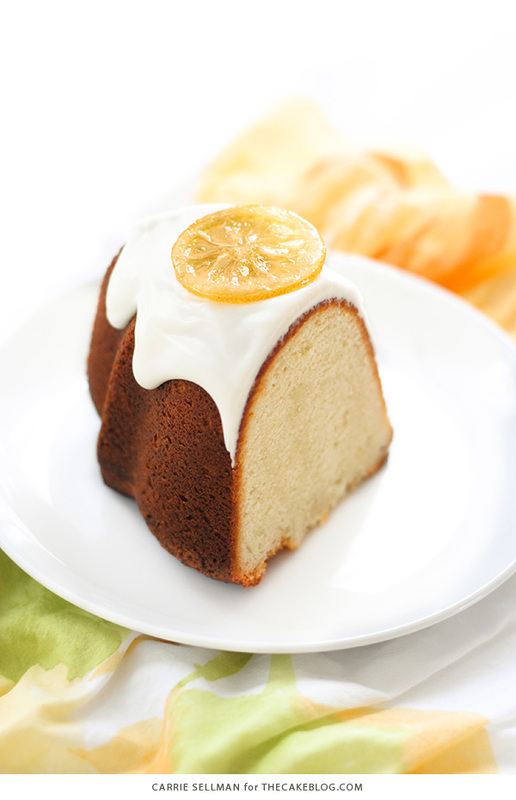 Serve up a slice of this refreshing cake, bursting with lemony flavor, and get back to celebrating life! Preheat oven to 325F degrees. Generously grease and flour Bundt pan, coating every nook and cranny. Set aside. In a medium bowl, whisk together the flour, salt and lemon zest. Set aside. In bowl of stand mixer fitted with the paddle attachment, beat the butter, cream cheese and sugar on medium speed 3 to 4 minutes until light and fluffy. Add the lemon extract and vanilla extract. Mix again to combine. Gradually add the dry ingredients while mixing. Mix until just combined, being careful not to over mix. Pour batter into pan and smooth out the top. Tap pan onto counter to remove any air bubbles. Bake 75 to 90 minutes until toothpick inserted into center comes out clean. If the cake is getting too dark, tent the pan with aluminum foil. Let cool in pan for 10 to 15 minutes, then remove to wire rack to finish cooling completely. In bowl of stand mixer fitted with the paddle attachment, beat the butter and cream cheese until smooth. Add lemon juice and salt. Mix to combine. Gradually add confectioners’ sugar. Mix and scrape down sides of bowl as necessary. Whip on high until completely smooth with no visible lumps of cream cheese. Wash lemons well and dry. Thinly slice into 1/8 inch thick slices and remove seeds. In a medium saucepan, bring water and sugar to a boil. Stir to help all sugar dissolve. Add lemon slices and reduce heat to low but maintain a simmer (not boiling). Cook, stirring occasionally, until slices are completely see-through, about 35 minutes or more (depending on how thinly you sliced the lemons). Using tongs, remove lemon slices and place onto a cookie pan lined with wax paper. Allow to cool slightly before placing pan into the refrigerator to cool completely. Once lemon slices are completely cool and set up, peel away from wax paper. Store in an airtight container, lined with more wax paper, in the refrigerator until ready to use. If layering slices in your container, place a piece of wax paper in between to prevent sticking and clumping. Once cake has completely cooled, place onto serving dish. Spoon frosting over the top, gently smoothing and allowing to flow over the sides. Refrigerate 30 minutes until the frosting is set. Garnish with candied lemon slices around the top. Candied lemon slices can be made in advance. Store in an airtight container, lined with wax paper, in the refrigerator until ready to use. If layering slices in your container, place a piece of wax paper in between to prevent sticking and clumping. Parchment paper will work as well. Store cake in refrigerator. Serve at room temperature. This is a gorgeous cake! I can’t wait to try making the candied lemon slices! I have never done this before and it is such a lovely touch! Very cool.. but do I need the wax paper for the candied lemon slices?? is it really necessary? Parchment paper would work as well, if you don’t have wax paper. The lemon slices get quite sticky when they set up. Placing them on wax paper or parchment paper will make them easier to remove without tearing. Yum! My daughter’s favorite dessert is an old Vermont recipe for lemon pudding cake, but it is not one that can be easily sliced and served to a lot of guests. This lemon cake with candied lemon slices is a terrific substitute for this year’s celebration, which will be in honor of her birthday AND her ‘shiny, new’ kidney, donated by my brother. I really enjoy your blog. Baking is my ‘therapy’ and your blog gives me a much needed boost of new ideas and skills. Such fun! Thank you for sharing your talents. Wow, what a birthday to celebrate!! Many prayers for good health for your daughter and brother. Hope you continue to find therapy in baking – it has always been a go to for me as well. Hugs to you Sarah Jane! 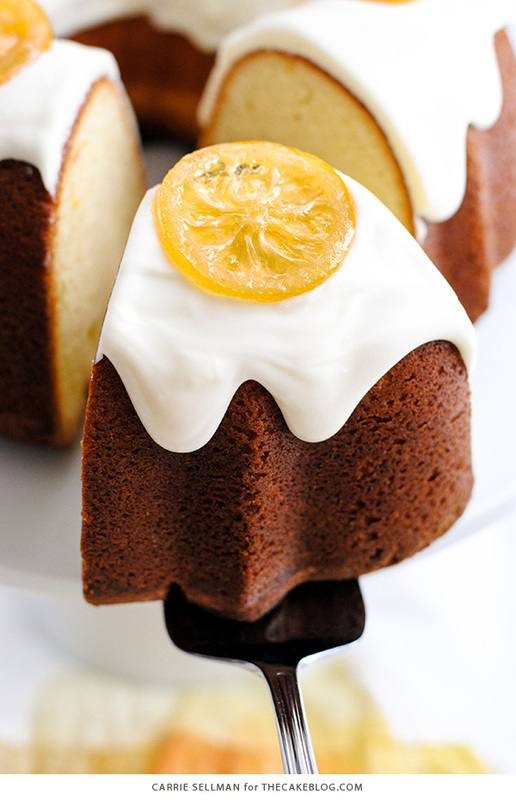 Could you brush the warm cake with some of the lemon syrup left from the candies luminize slices? Do you really candy the lemons for 35 minutes? I tried this last night, and the ones I simmered for 35 minutes tasted burnt and the sugar/water mixture was a dark caramel color. I did a second batch that I only simmered for 15-20 minutes, and that was much more successful. These ones do taste delicious! I haven’t made the cake… that’s for the weekend! I did candy the lemons for 35 minutes. Maybe the difference was due to how thin the lemon slices were or how high of a simmer was rolling. I’m glad your second batch worked out better for you! !